The European photographic company, AgfaPhoto has unveiled its new rugged DC-600uw camera. The DC-600uw camera has been designed for resistant to dust, shock and underwater submersion of up to 30 feet deep. The phone is featured with hot key button for users to toggle between land and underwater mode easily. Featured with a 2.4-inch LCD display, DC-600uw is also equipped a 6.1-megapixel CCD with 5x digital zoom with face recognition focus function. It also supports YouTube video recoding and has built-in 32MB of internal memory. In addition, it supports up to 8GB SDHC memory card and comes with two AA batteries. 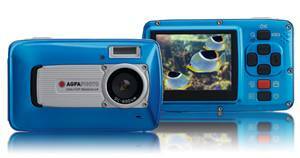 Available in blue, the Agfaphoto DC-600uw is priced at 149 euros in Europe. The camera is also available in US via Plawa for the price of $199.